Wow! What a game by UST Tigers, they displayed good offense and defense the entire game to think that most players have been playing for UST and PBA DLeague since Sunday. How I wish that was game2 of UAAP finals haha! UST is now 1-0 on the Philippine Collegiate Championship League Final 4. This is a nationwide tournament, UST defeated Letran last Sunday during the final8 level. They won over Adamson last Monday to be the Metro Manila Division Champion and booked the last final four slot along with Ateneo, San Beda and SWU. Jeric Teng scored 17 of his 24 points in the first half while Abdul and Mariano were the best players on previous games. The future looks bright because aside from the 3 key players, Ferrer has been consistent, he was the best player on the BlackWater game last Tuesday! But I'll surely miss the captain, pointguard Jeric Fortuna, especially with that clutch 3 point shot while Ateneo was catching up! He ended up with 9 points, 7 assists and 8 freaking rebounds! Wow! Here are the rest of the schedule of single round robin matches and maybe the last tournament to watch their batch play and win together. 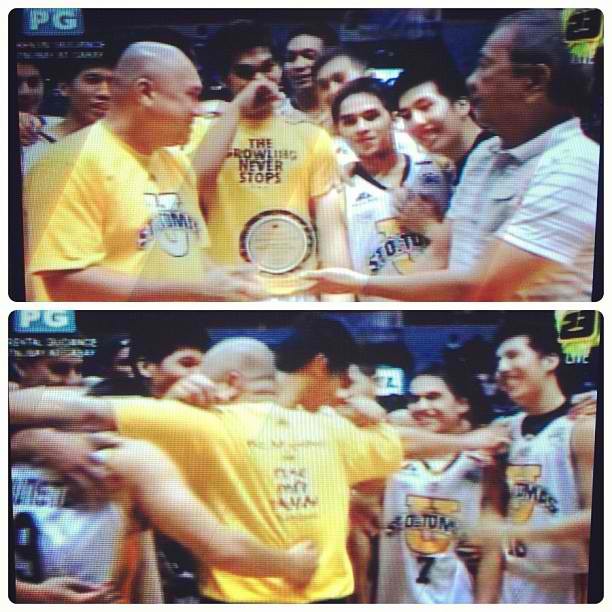 Go USTe!